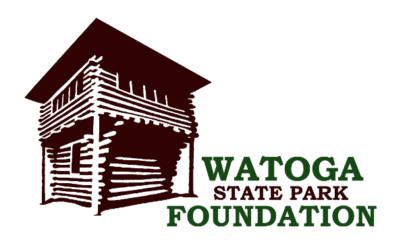 A nice loop trail from the Pine Run Cabin area is starting on either Pine Run Trail (Cabin 28) or TM Cheek Trail (Cabin 21). The loop is sewn together with a short section of the Honeymoon Trail and TM Cheek Road. An added plus to this moderately strenuous hike is passing the TM Cheek overlook. Since it is approximately the halfway point, it is a good spot to sit on the bench and take in the great view for a bit. Today was hiking with canine companions. My canine associates and I cleaned up this loop hike today. We left behind a few larger trees to be cut with a chainsaw in the near future. These obstacles were delimbed and are easily negotiated. I want to introduce you to one of my two trail maintenance assistants, Mr. Bongo T. Bones. Bongo came to me by way of a dog rescue group in Missouri who, in turn, got him from a breeder. Bongo had the misfortune of being born with an under-bite. Breeders do not often tolerate any physical irregularities; sometimes destroying such dogs when they are puppies. I personally love his slight imperfection. I think it gives him a unique look matching his enthusiastic personality. He is always ready for fun or work. Bongo is a West Highland White Terrier, a breed originating in the Scottish Highlands. So our West Virginia mountains are a perfect home for this breed. 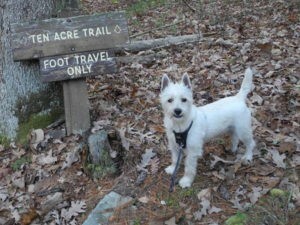 Westie’s as they are called are smart, friendly and seem to know that we are out in the woods to perform a task. When I stop on the trail to remove an obstacle they sit off to one side and patiently wait. 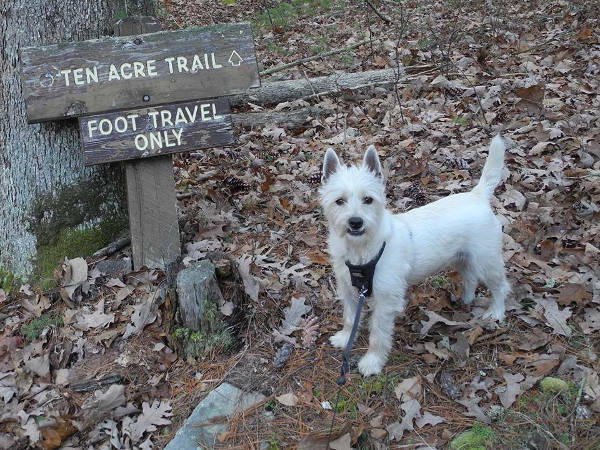 Then I give the order to “go trail ” and we resume our hike. They absolutely could not be better companions. And they never, ever, complain. Hiking with canine companions. 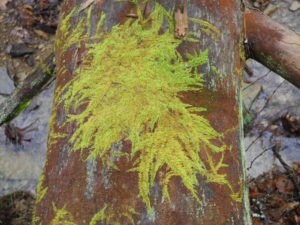 Now meet Mr. Mossy Log……… No, I will save that for another day.